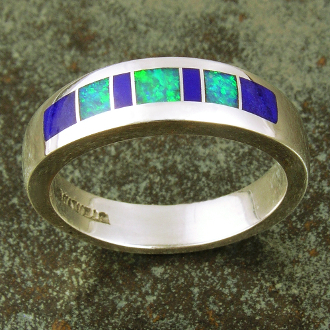 Sterling silver ring inlaid with lapis and Australian opal. The Australian opal inlay is a nice blue-green color and harmonizes nicely with the blue lapis. The ring measures 6mm wide at the top and is shown in a size 6 1/2. This ring is available by special order in 4 to 6 weeks. Just select your size from the drop down size menu! This ring would make a nice alternative wedding band for someone looking for something interesting in place of a plain gold band. Opal is a tightly packed array of millions of spherical particles of amorphous silica (SiO2 NH2O). Opal has a hardness of 5.5 to 6.5 on Moh’s Scale. It is estimated to take five million years to form a layer of opal one-centimeter thick. Opal is the only gemstone known to man to have the natural ability to diffract light. An opal’s color is created when the voids between the particles split light entering the stone. The size and alignment of the spheres and voids, as well as the light source, determines the colors produced. To view an opal’s color play at its best, the light source must be coming over your shoulder. An opal’s color can cover the full spectrum of the rainbow.